Any+Time was one of the more interesting options I covered in my Quick Review of jQuery Date/Time Widgets the other day. Any+Time had a lot more functionality than I got to investigate at the time, and there were some specific features I wanted to checkout in more detail - in particular timezone handling - so I built another little demo called kalinka. kalinka is a simple tool to construct Google Calendar Event URLs without needing to publish an event in your own calendar. You can then put the link in an email or a website. 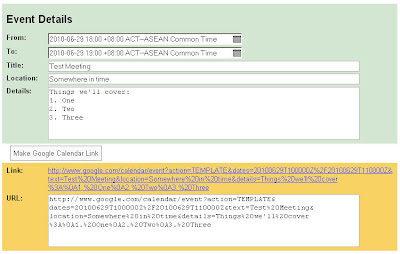 Other people can then use the link to create the event in their own Google Calendar. kalinka mimics the basic functionality of the Google Calendar Event Publisher, except that it also demonstrates using Any+Time to offer specific control of the timezone. Try out kalinka here, and feel free to pillage the scripts. ya really cool and helping information ... Nice Script i used it really works good..
What happened to Kalinka? I use it often but the url just redirects now. Oops, sorry about that. The old kalinka site got lost in some spring cleaning.